Be the first to hear about their new releases and deals. Download the Booksprout app and search for Kenneth S Sumerford today! 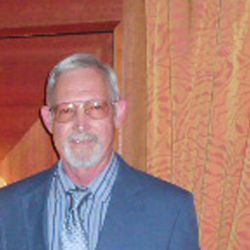 Kenneth Scott Sumerford is a writer, author and amateur scientist. His book Liberty: Romance Out of a Clear, Blue Sky is about intelligent design, evolution, romance and spiritual insights. This novel has 39 chapters (Books 1 and 2) and is more than 590 pages in 6"x9" paperback format. While a work of fiction, the book draws on research from more than 15 books in science and 2 books in philosophy. In August 2018 the book was re-edited and published as Liberty: Romance Out of a Clear, Blue Sky Book 1. Book 2 will be published in September 2018. Kenneth lives in North Texas with his wife Donna. He and his wife have a son (Scott), a daughter (Angela), son-in-law (Jason) and eight grandchildren. His education includes a M.B.A. in business and economics from Missouri State University in Springfield, Missouri and a B.S. in biology from the same university. His experience includes more than 25 years in Information Technology including software engineering, computer programming and Website development. He has also worked in manufacturing for about 12 years and was a Certified Quality Engineer for 3 years. Kenneth is an avid reader and researcher. He has worked for such companies as Caterpillar Corporation, Venture, Bell Helicopter, Lockheed-Martin, Sabre/Sabre Airline Solutions and done I.T. work for a few small companies in the United States.